Joanna Cassidy became certified in scuba diving for the 1979 ABC-TV series 240-Robert in which she played helicopter pilot Deputy Morgan Wainright. Joanna Cassidy is 5'-8" tall. In high school, Joanna Cassidy played field hockey, basketball and baseball. During the filming of the "240-Robert" tv series in 1979, Chuck Tamburro, the Helicopter Stunt Pilot, gave flying lessons to Joanna Cassidy so she could fly the helicopter N506WW. 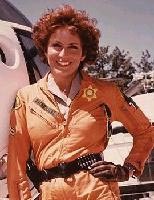 During the filming of the "240-Robert" tv series in 1979, Joanna Cassidy bought a Smith and Wesson 45 and took some shooting lessons from Chuck Tamburro, the Helicopter Stunt Man Pilot/Marksman. 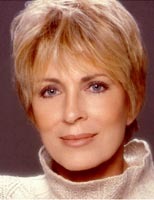 Joanna Cassidy has a boisterous laugh and a well-earned reputation as a practical joker. One day, when "240-Robert" was filming on-location at a maternity hospital for unwed mothers, the script called for Cassidy to emerge briskly from an elevator and stride down the hall. The lights and camera were ready, the elevator doors opened, and out she stepped with a tremendous pillow tucked under her deputy's shirt. Shooting had to be stopped as crew and cast regained their composure. On another occasion, the chopper was hovering outside the top floor of a Los Angeles hotel trying to locate the window where a rescue was to be staged. Suddenly, a voice came over the radio commanding the director to wave his underwear out the window so Cassidy and the pilot would know where he was. The crew broke up, and when a booming laugh followed, they knew it was Cassidy. Joanna Cassidy entered Syracuse University in New York, but after one year as an art student, she quit to marry a young doctor. In the impetuous Cassidy tradition, she did not pick an easy course to marriage. Cassidy said, "He'd been dating my art teacher. I broke them up - and my art teacher flunked me." A doctor's life was not the happily-ever-after fantasy she had dreamed up and she and her husband were divorced in San Francisco seven years later. 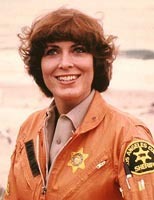 In 1979, on the set of "240-Robert," Joanna Cassidy used her moring off to cook a Mexican meal for the crew of 60 people. For her birthday she hired a Rolls-Royce to deliver champagne on ice to the set for everyone to share. For pets, Joanna Cassidy has had a cat, a puppy and several boa constrictors.